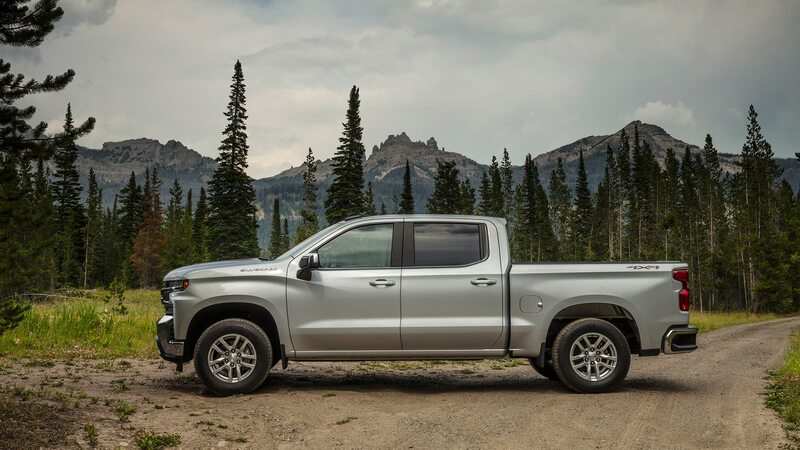 JACKSON, Wyoming — Developing a new full-size truck is no easy task. 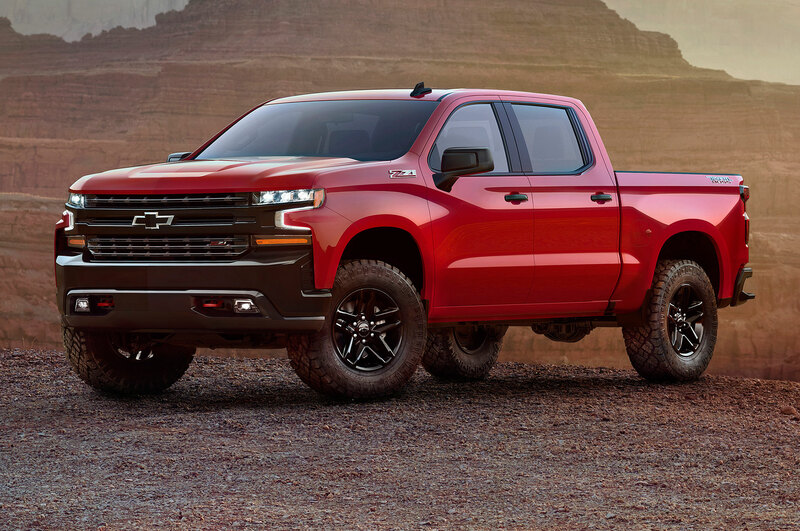 The customers of the nation’s largest vehicle segment are a demanding bunch. 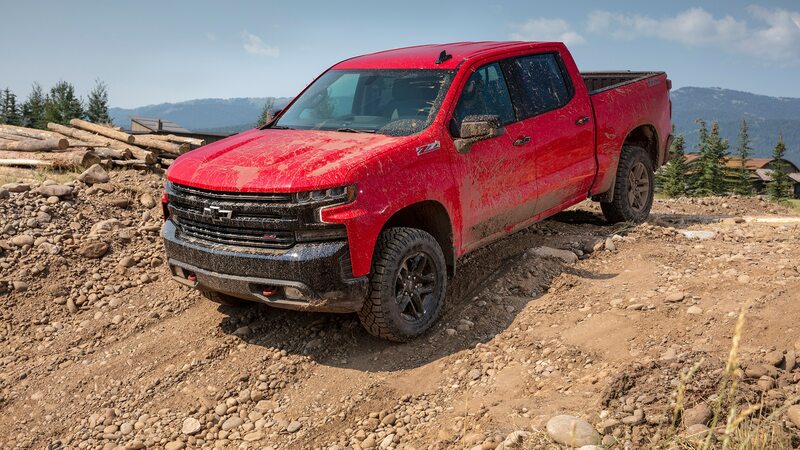 And given how much money is on the line, the pressure is intense on the folks who make the trucks to keep loyal buyers happy—all while continuing to innovate. 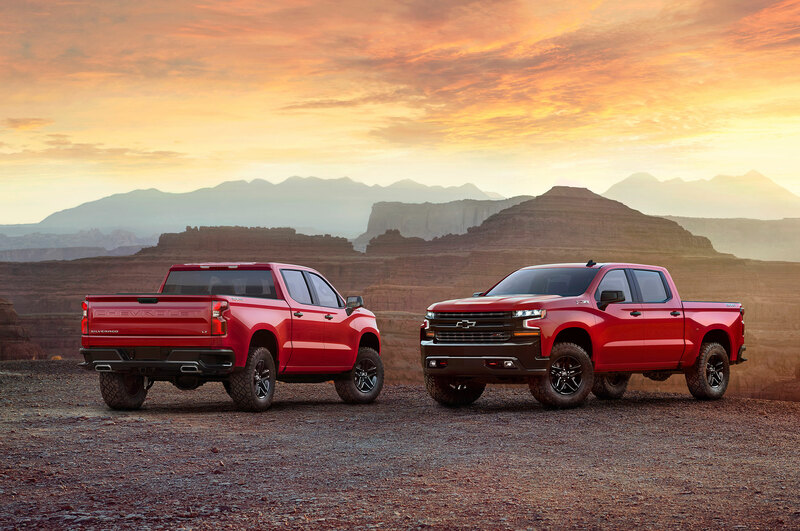 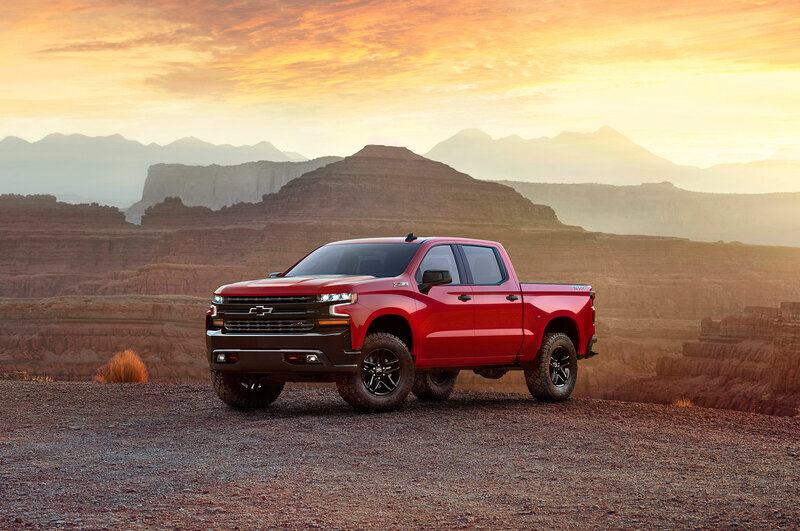 The present Silverado was launched just five years ago and remains popular (sales for the first half of the year are up 10.7 percent) so it’s not too surprising that the Chevy truck team erred on the conservative side when planning the redesign of the 2019 Silverado. 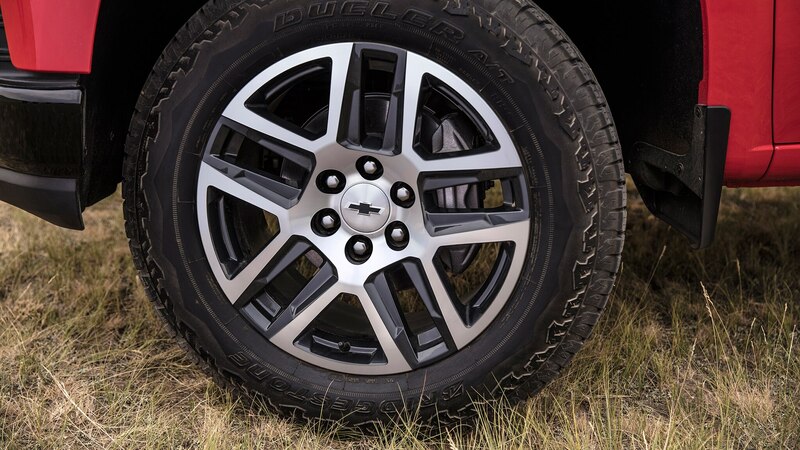 How conservative? 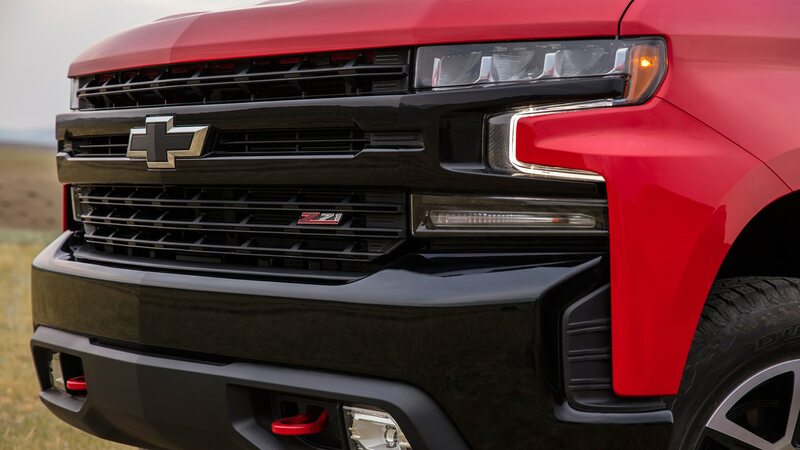 Consider that the word “frame” doesn’t appear a single time in the press release. 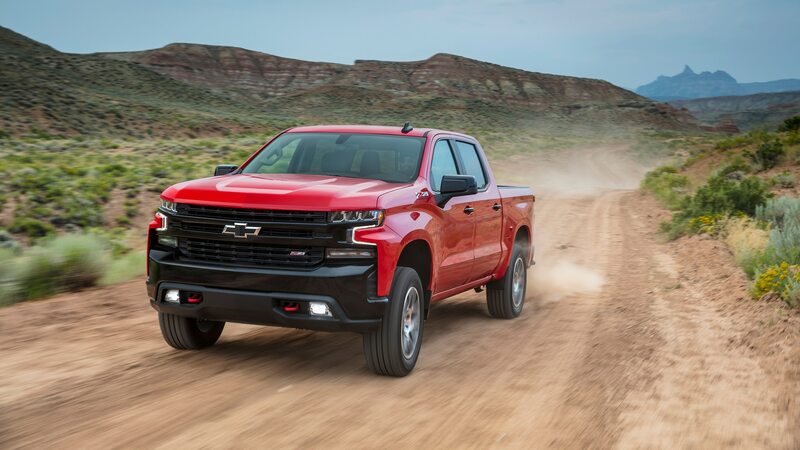 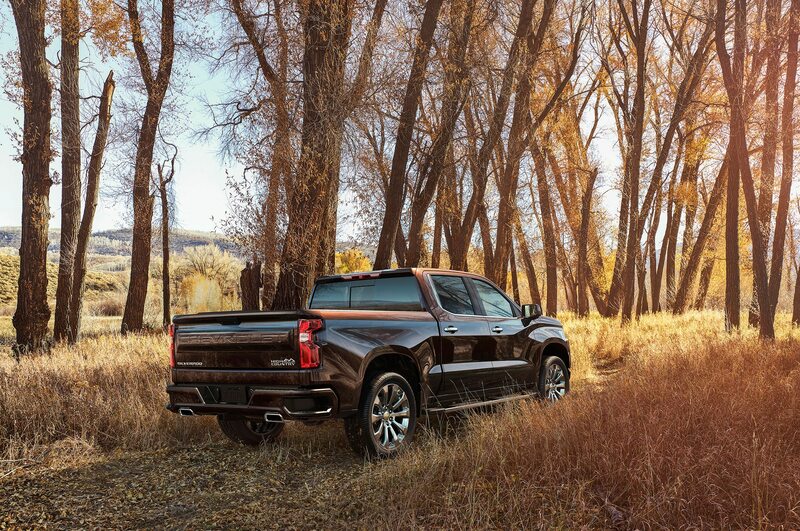 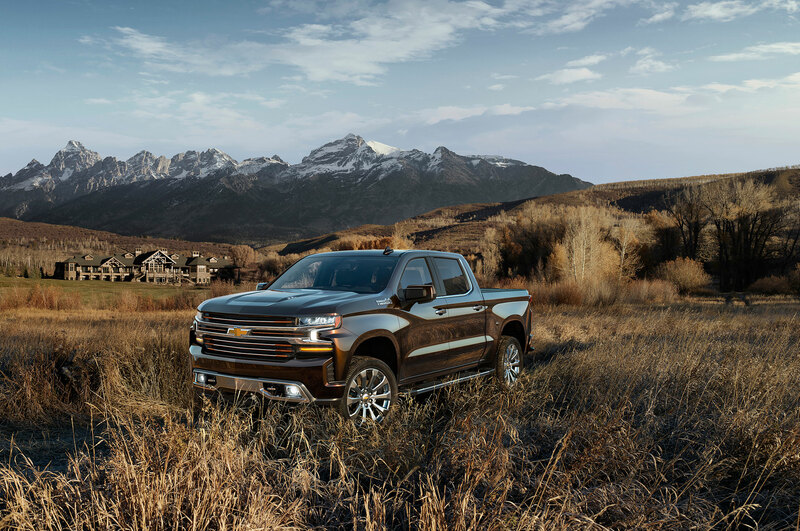 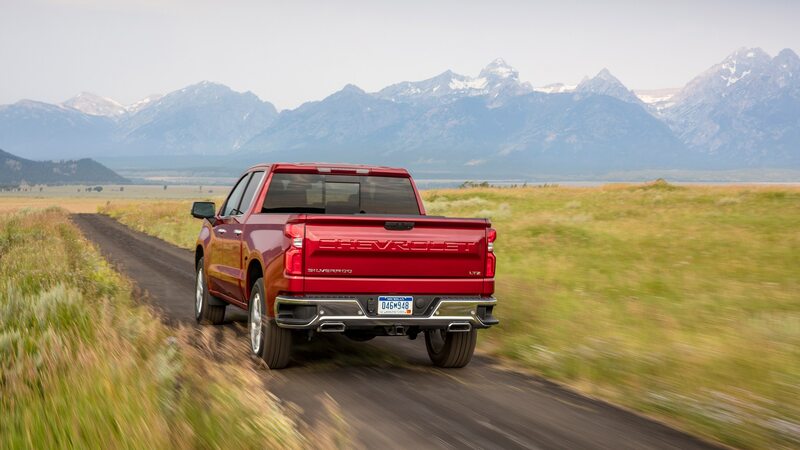 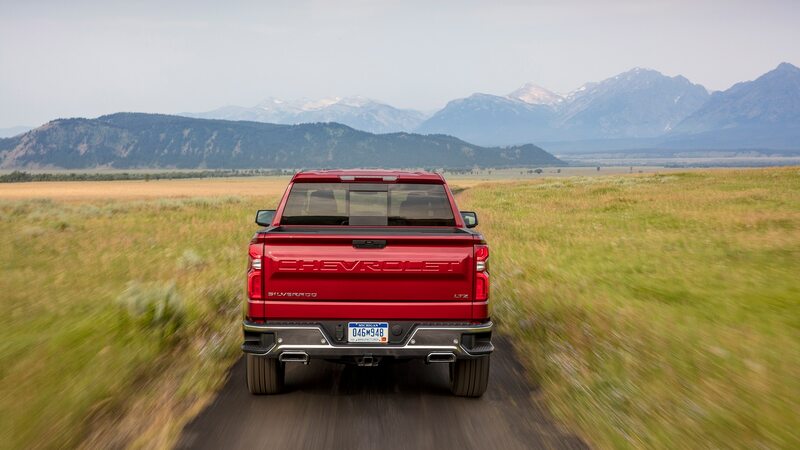 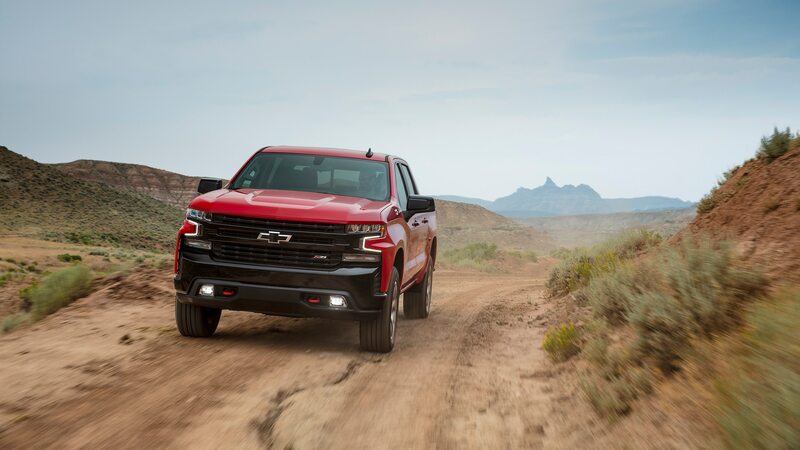 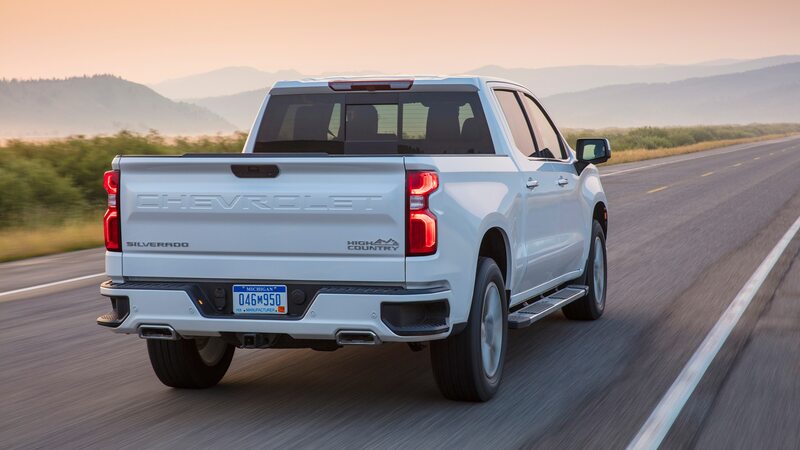 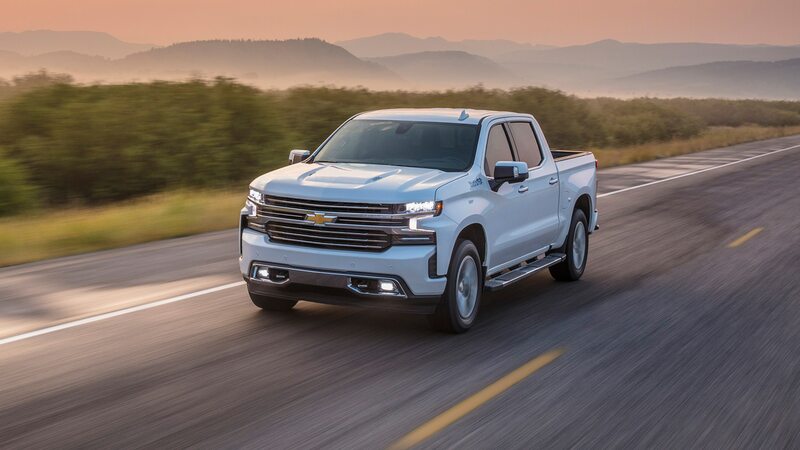 Visually, the 2019 Chevrolet Silverado has considerable presence even by the standards of its class. 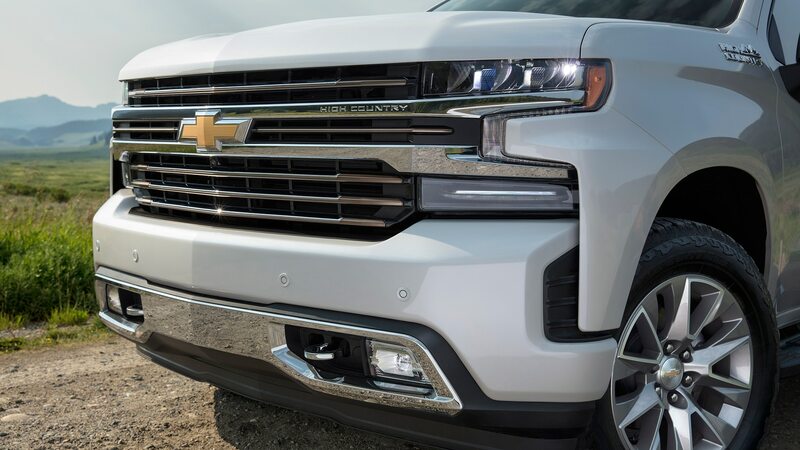 The front end is a bit more rounded, aerodynamic and modern looking than before, and benefits from the use of LED lighting. 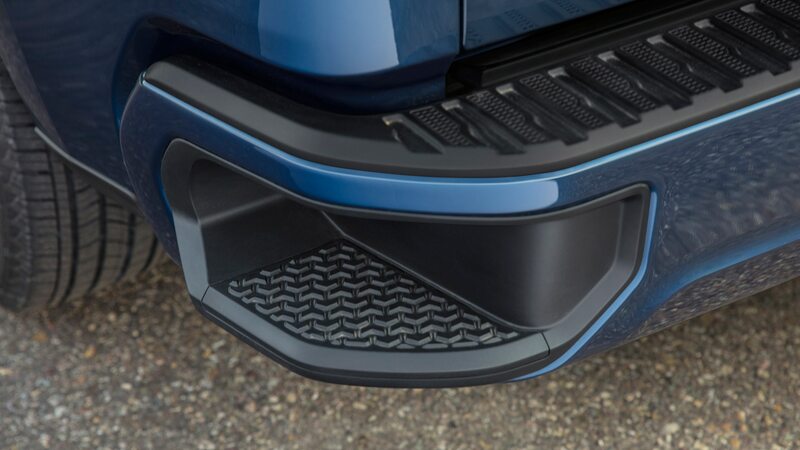 (That said, the bit of fender that protrudes into the grille doesn’t entirely work to our eyes.) 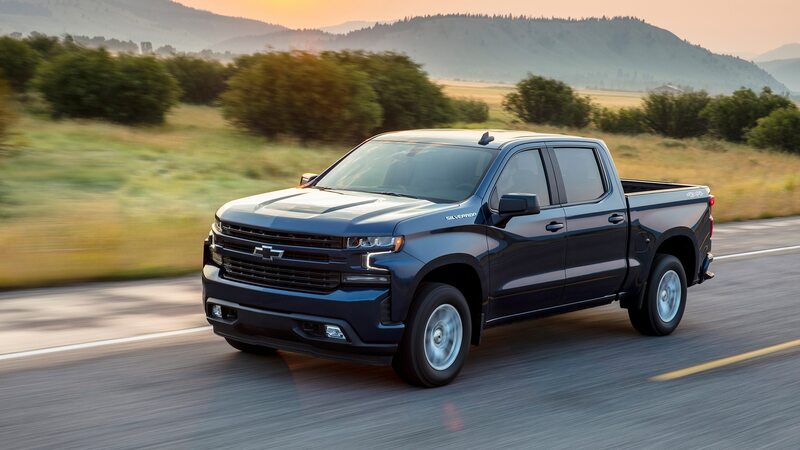 Gone are the Silverado’s long-standing boxy wheelwells, replaced by a more conventional rounded approach that pairs well with the tall door panels and bed walls. 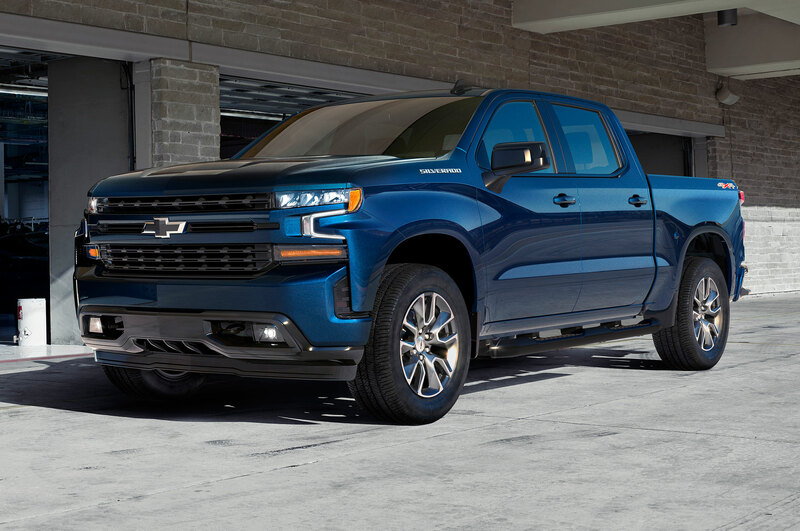 Out back, the new Silverado received stylized taillamps instead of the usual simple rectangles, while the rear bumper features larger corner steps. 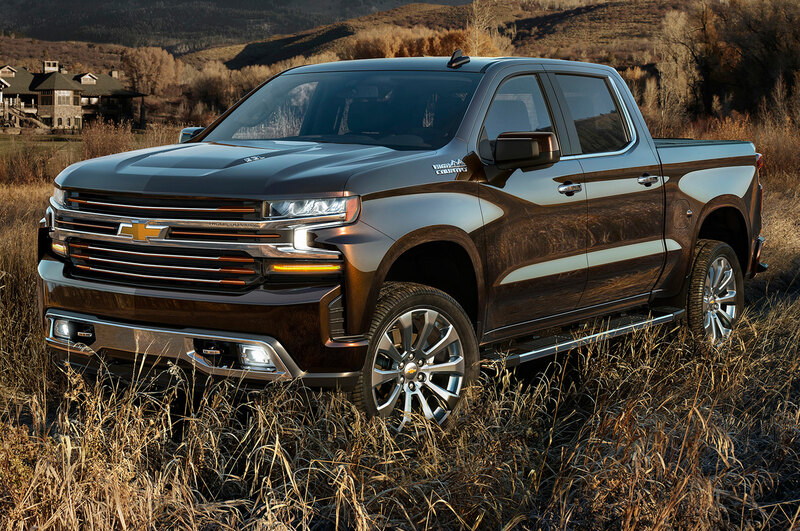 If this new Silverado looks even bigger than before, that’s because it is. 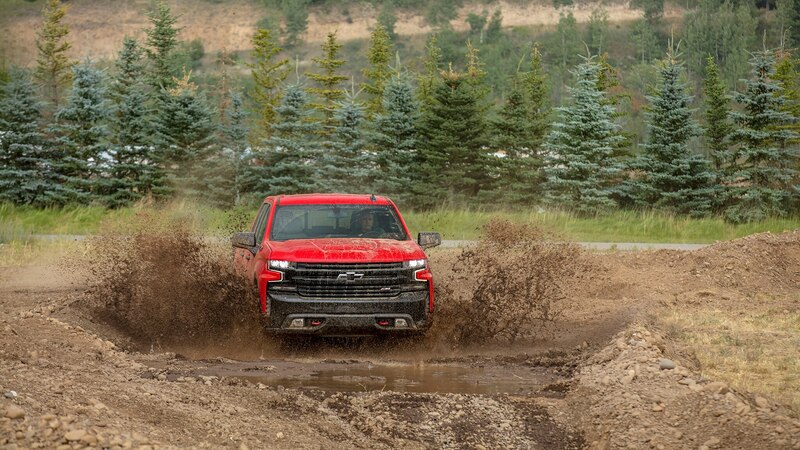 We sampled the range-topping Silverado High Country, which starts at $54,495 for a 2WD model and comes in a crewcab/shortbed configuration (our 4WD tester rang in at $64,030 after options). 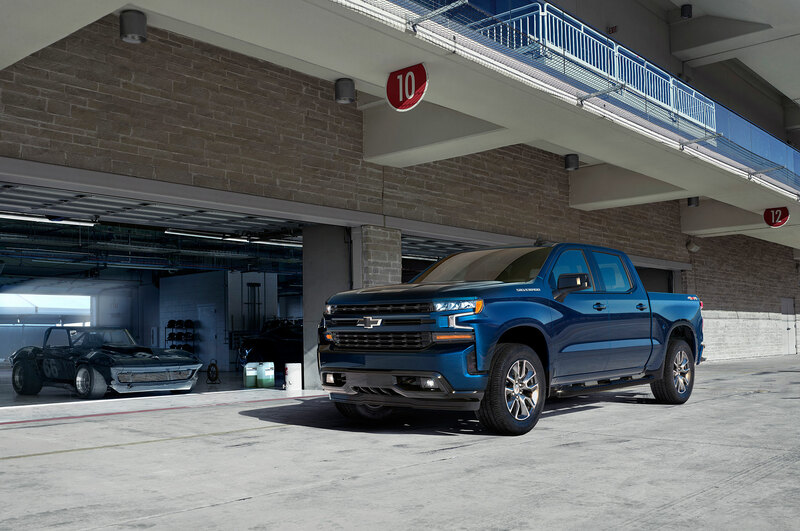 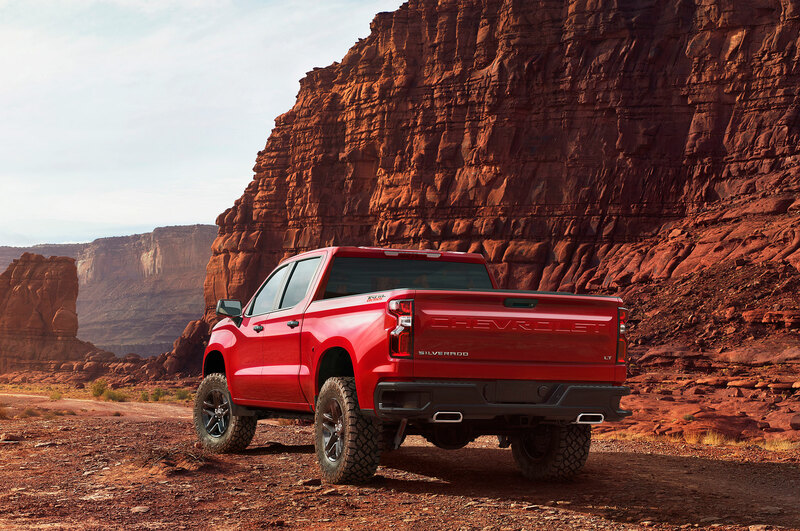 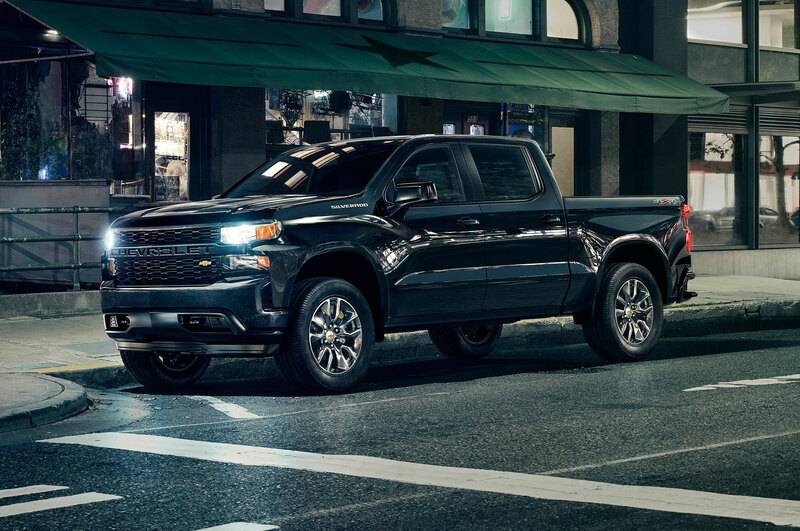 In this setup, the 2019 Silverado is 1.7 inches longer, 1.2-inches wider, 1.5-inches taller, and rides on a 3.9-inch-longer wheelbase. 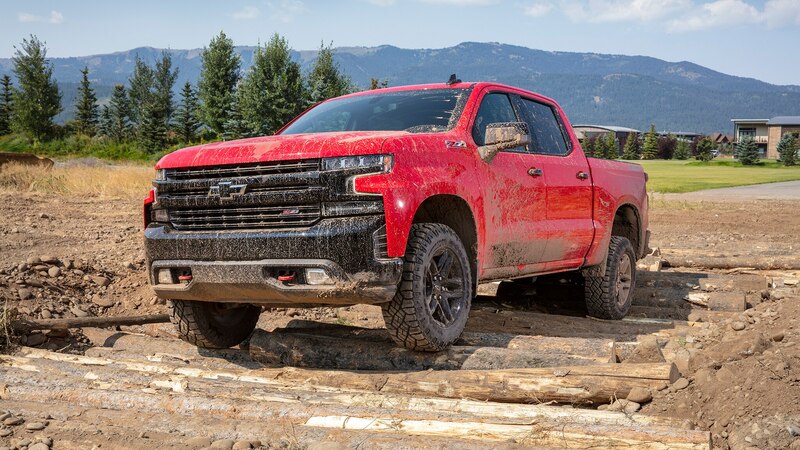 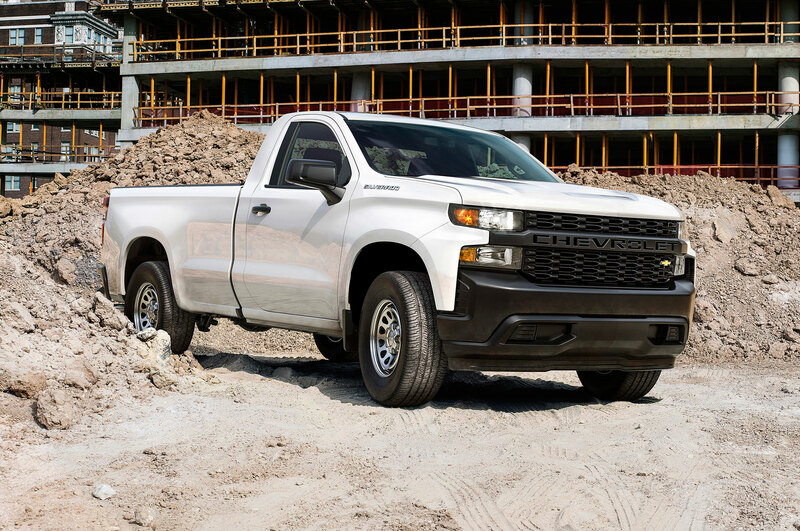 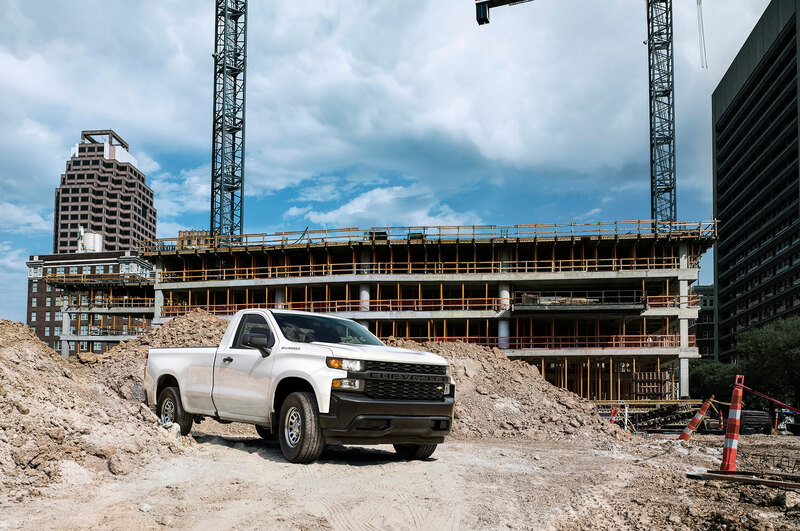 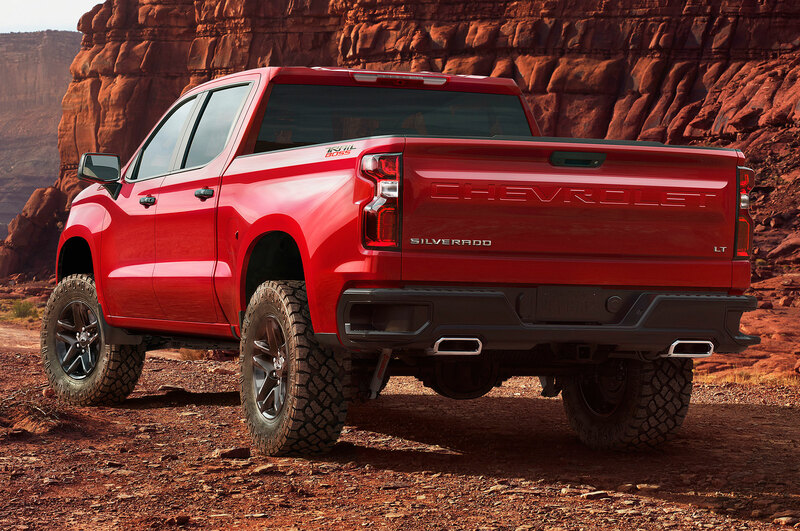 Despite the size, Chevrolet says that the new Silverado is up to 450 pounds lighter than before thanks to more extensive use of lightweight materials in the truck’s construction. 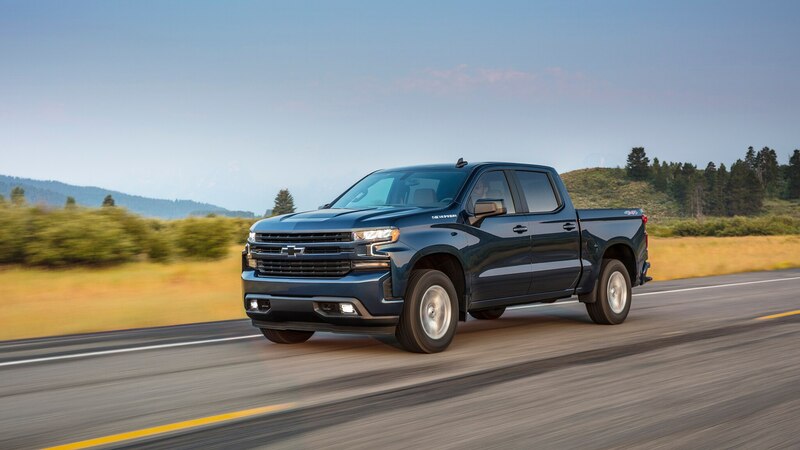 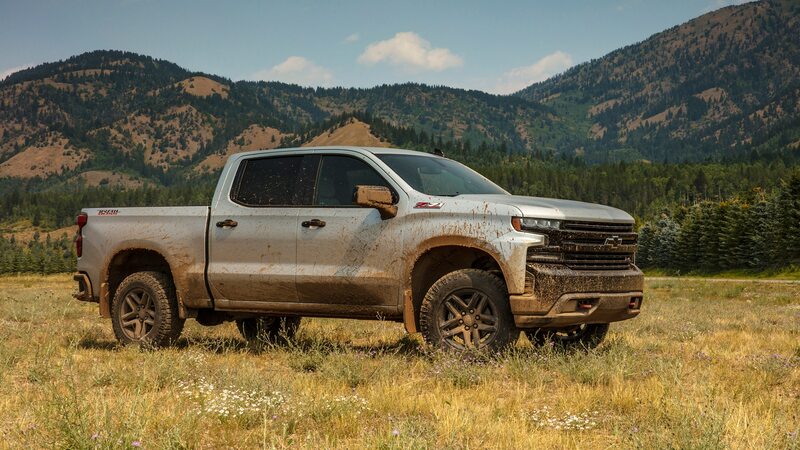 Even with elevations well above a mile, which no doubt sapped some of its 420 horsepower and 460 pound-feet of torque, the High Country’s optional 6.2-liter V-8 made ample power for hauling air and didn’t require any undue pressure on the accelerator. 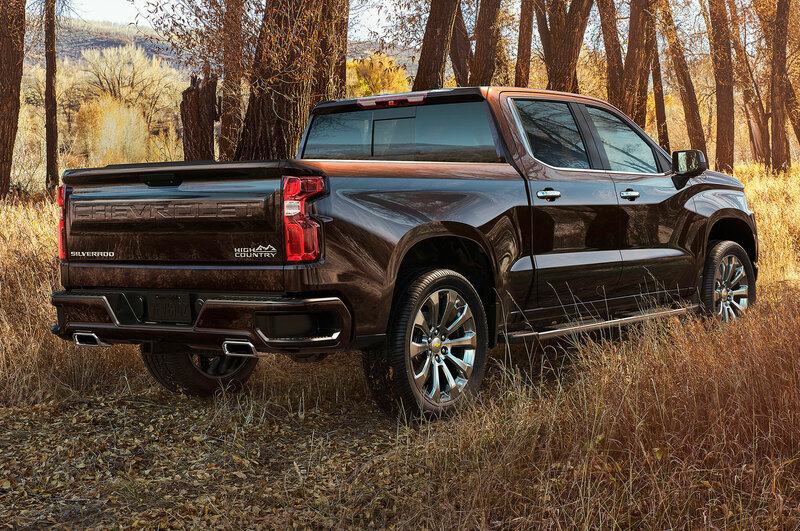 Available only for 4WD models, the 6.2-liter is a $2,495 option that also adds a 10-speed automatic transmission. 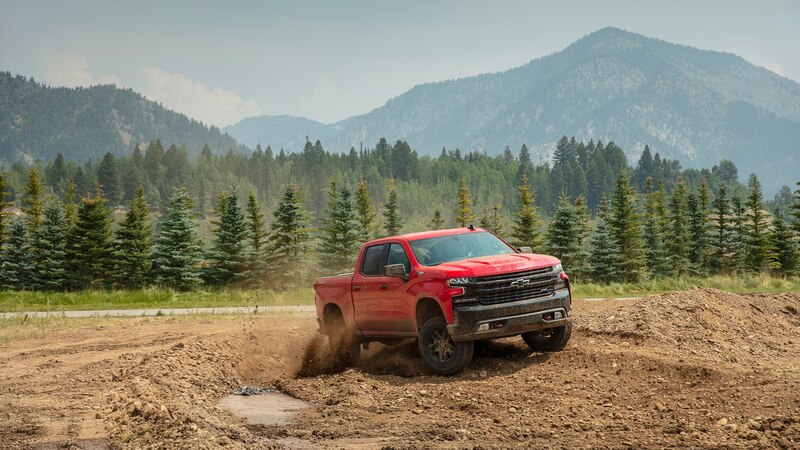 The gearbox proved nearly invisible during our drive, though a good chunk of the route was effortless cruising, much of it downhill. 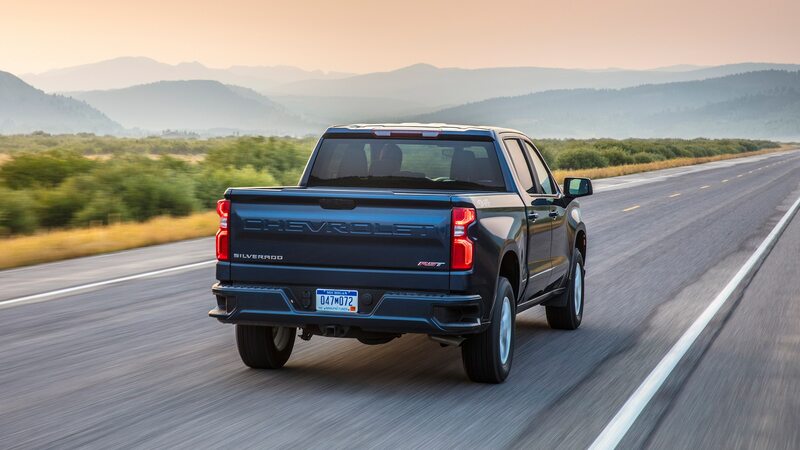 The downhill stretches are also partly why we saw an indicated 25.8 average mpg over the course of our drive, an impressive figure well above this powertrain combination’s EPA rating of 16 mpg city, 20 mpg highway. 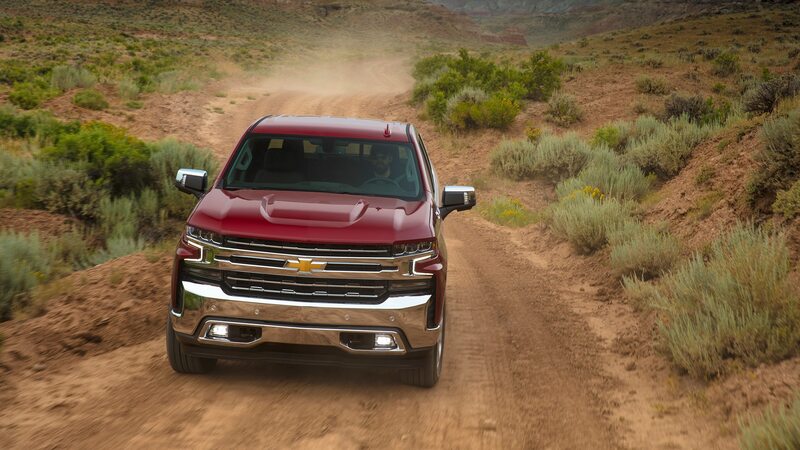 But it’s one thing for a powertrain to adeptly handle no-stress conditions; how well this Silverado handles the Thunderdome that is Los Angeles traffic remains to be seen. 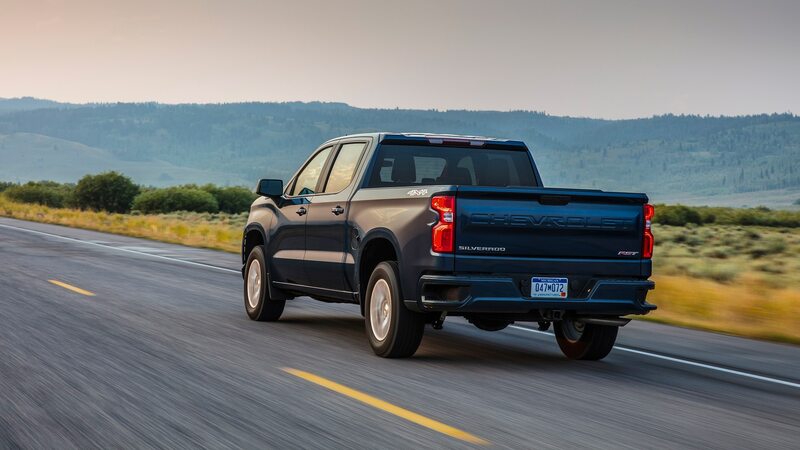 While they’re good for countless amazing views, the smooth and wide-open highways of western Wyoming and eastern Idaho do not provide a substantial challenge to any modern car, let alone a brand-new luxury truck. 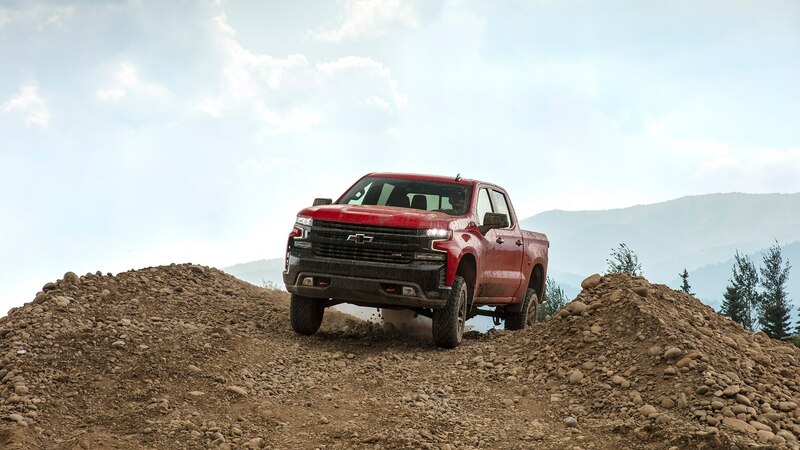 The high-end Silverado’s ride was comfortable and confident, the suspension neither too hard nor too soft. 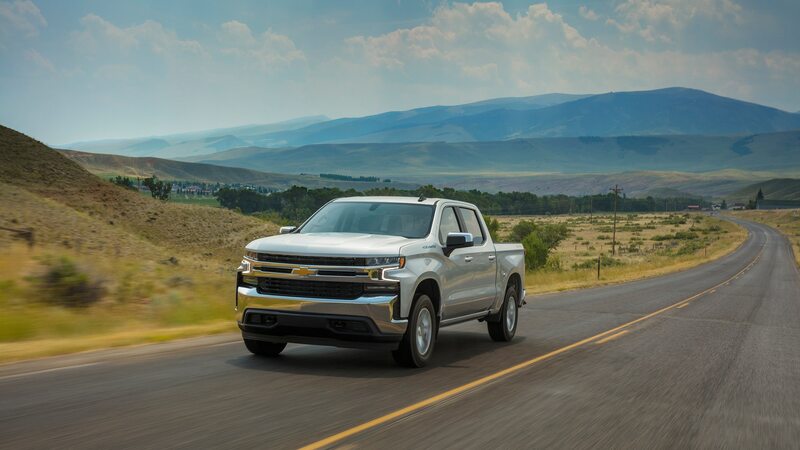 It likely doesn’t suffer from significant freeway hop, but determining that for a fact would require a stint in the semi-truck-battered right lanes of Southern California’s Interstate 605. 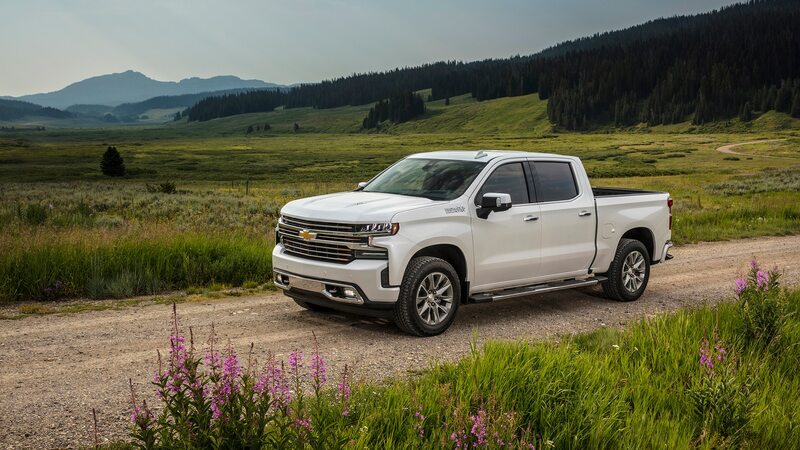 The cabin is quiet, aside from the cruising drone of its engine, and it’s not just a feature of the range-topping High Country. 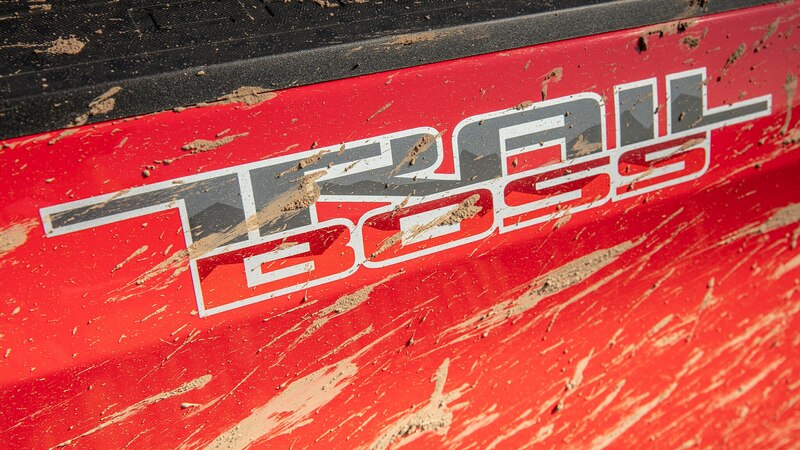 Noise was similarly absent inside the lifted LT TrailBoss we also spent time in. 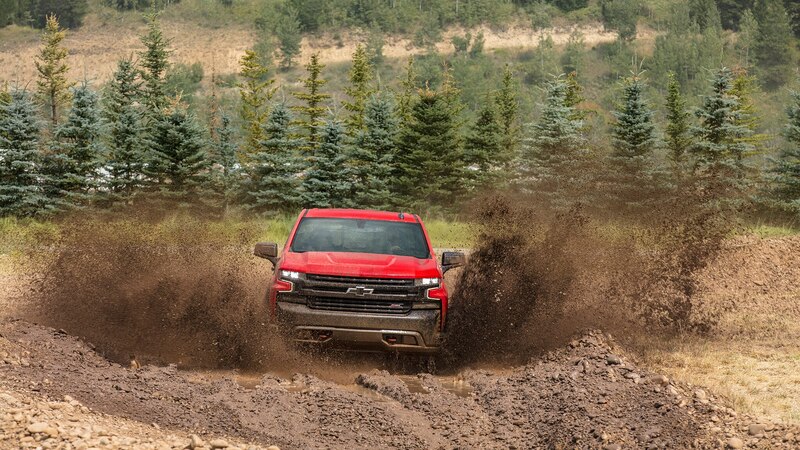 The turns that did present themselves were handled without excessive body roll. 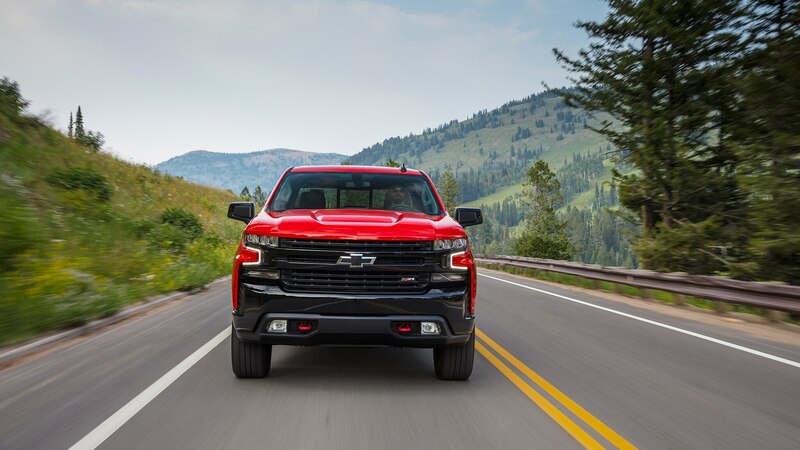 Thanks to targeted enhancements made to the front suspension, the 2019 Silverado’s steering is satisfyingly precise. 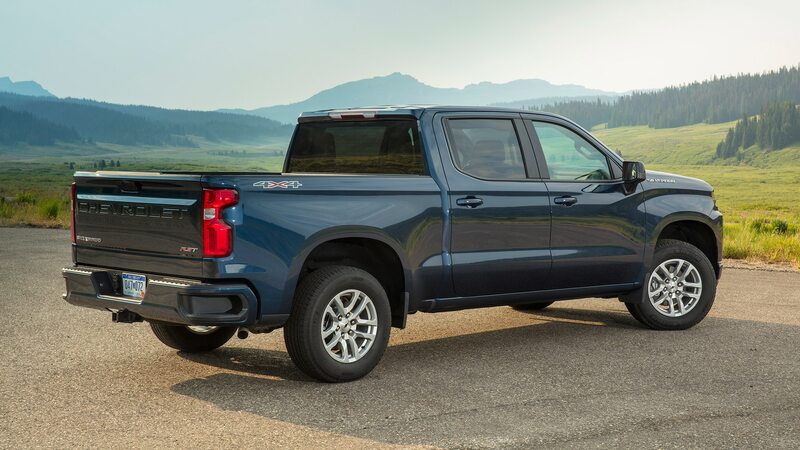 It’s pretty quick and light, too, making the truck rather enjoyable from behind the wheel. 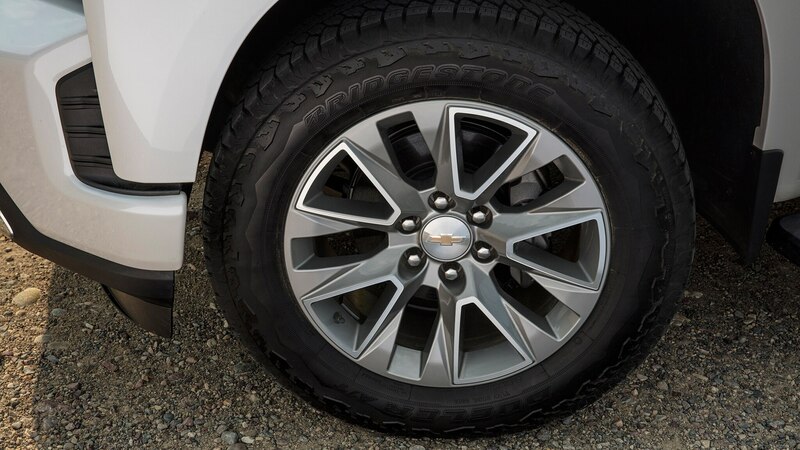 And while feel is muted, little vibration makes it up through the steering rack as well. 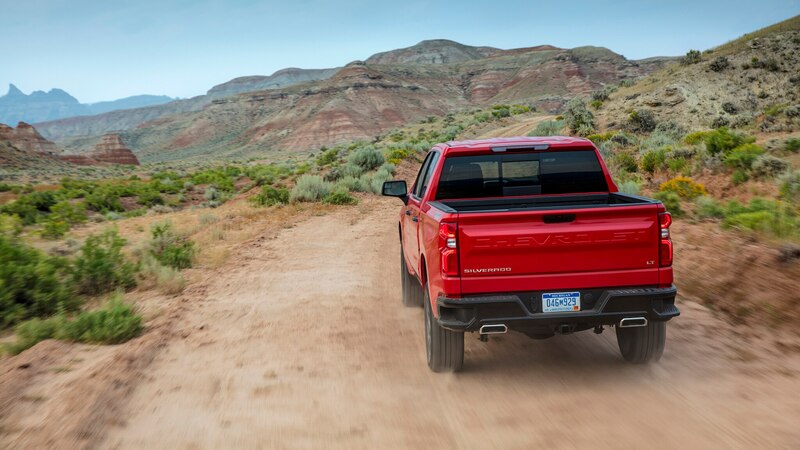 Due to Wyoming’s lack of traffic, we mostly used the brakes to control speed while on downhill grades. 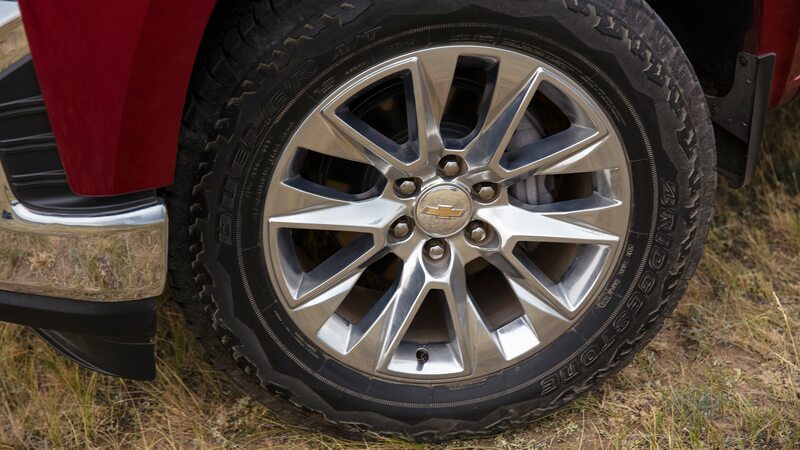 When they were necessary, they progressively and predictably increased pressure. 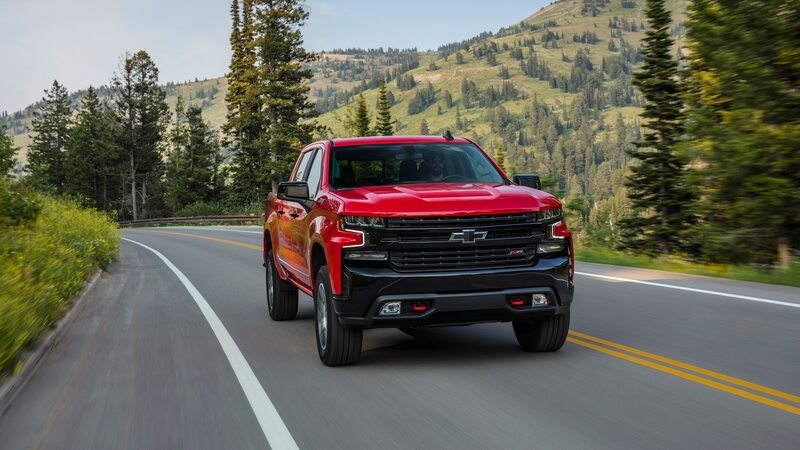 Inside, the 2019 Silverado is immediately familiar to anyone who has spent time in the outgoing model, although almost every part of the dash has been reshaped and several controls have been relocated. 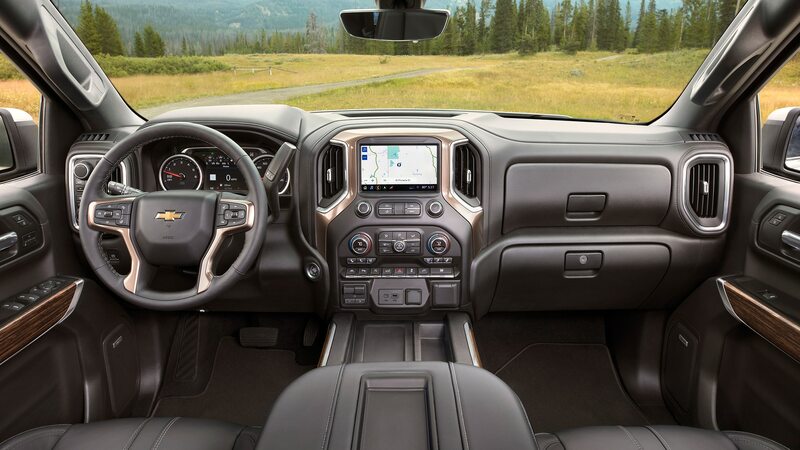 Chief among these is the relocation of the trailer brake from the left side to the center stack, while the seat heater/cooler controls have been relocated beneath the temperature control knobs. 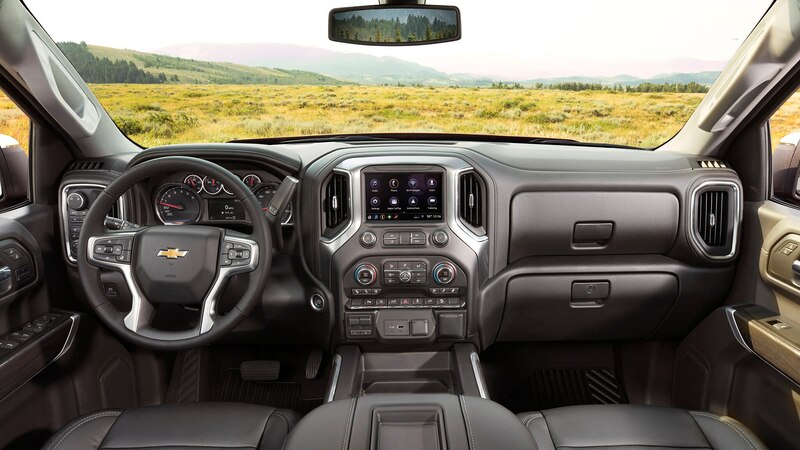 The steering wheel is better aligned with the center of the seat now, too. 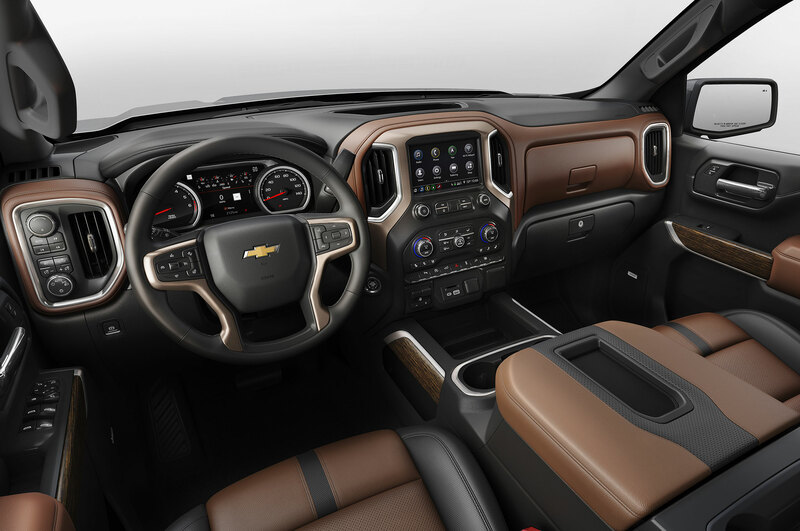 But fear not, traditionalists—the column-mounted shifter remains. 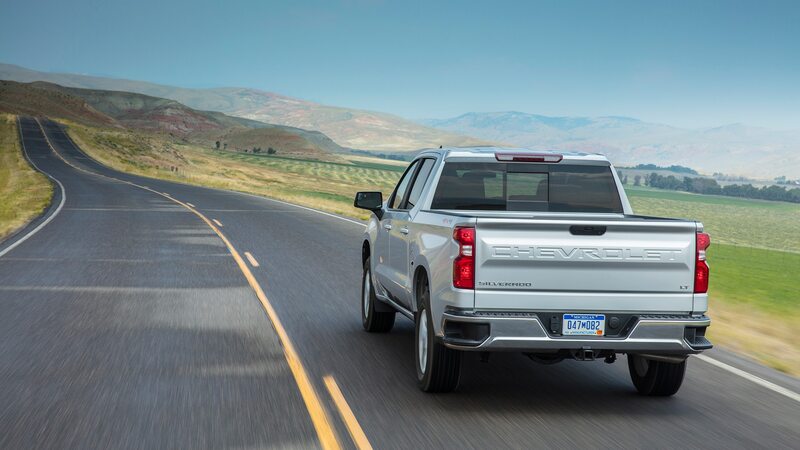 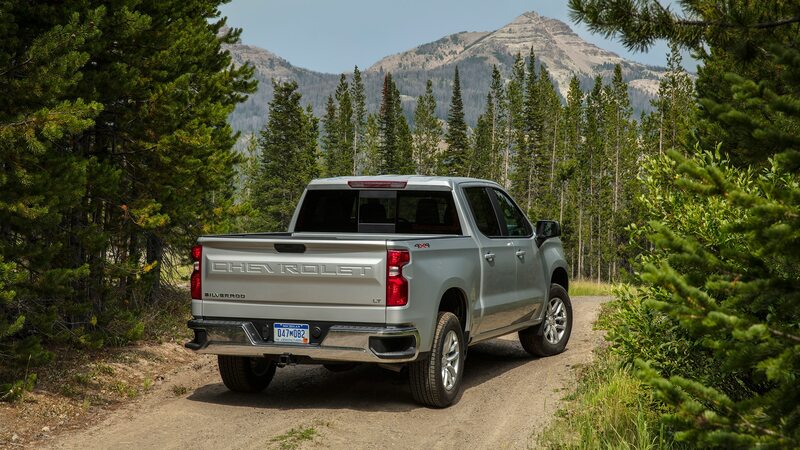 Standard on the High Country is the new Advanced Trailering System, which adds a “Hitch View” mode for the rear camera that provides visual guidelines to help aid with trailer connection. 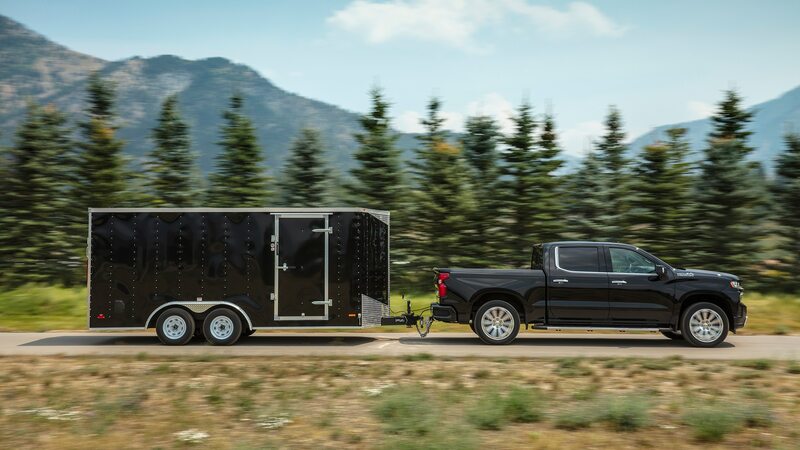 The function automatically sets the parking brake after switching the transmission into Park while using Hitch View, and monitors the trailer’s tire pressure if the trailer is equipped with a monitoring system. 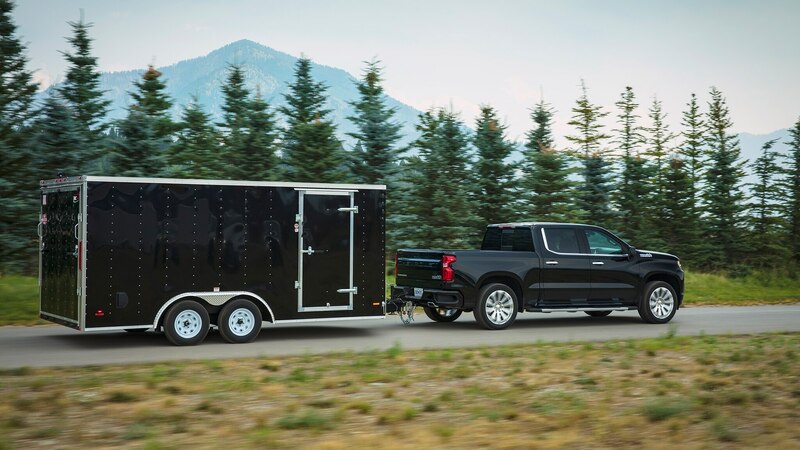 Also making hitching easier is the optional is the Trailer Camera Package, which adds side-view cameras as well as the ability to use an accessory camera that connects to the trailer. 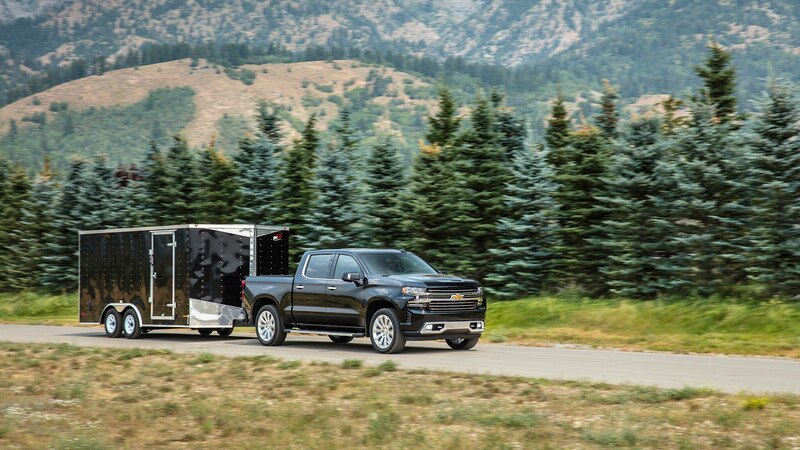 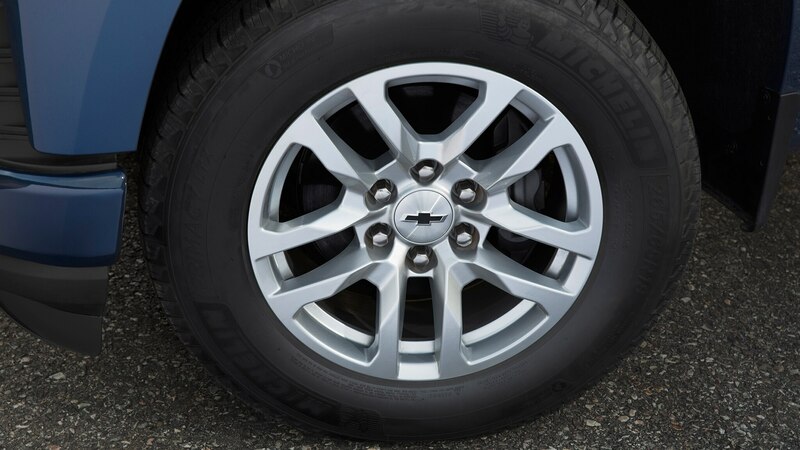 Other towing-oriented gadgetry includes the ability to store five trailer profiles (which saves the trailer brake gain settings as well), and the new Trailer Theft Alert System, which sets off an alarm if the trailer is disconnected and an alert to the myChevrolet phone app if you’re an OnStar customer. 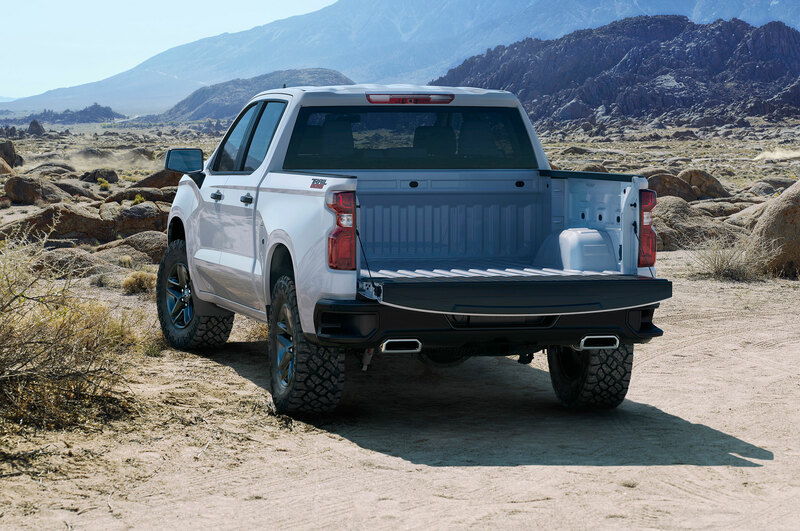 Owners can also access their trailer profiles and trailer light test function through the app. 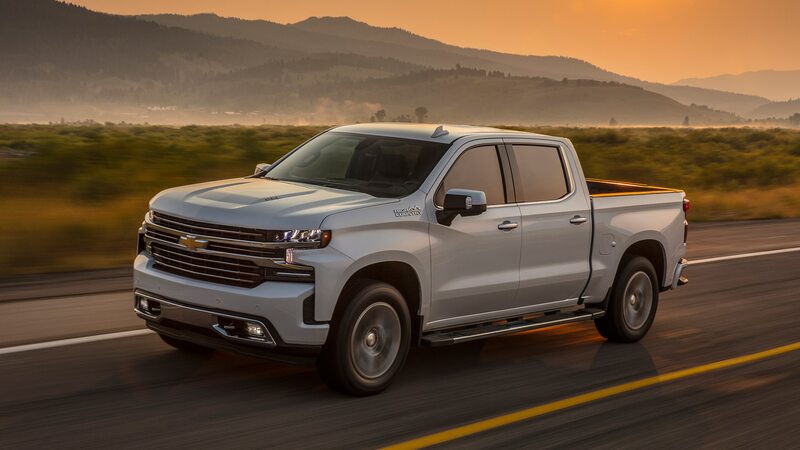 Additionally, each Silverado now gets a model-specific label that tells the owner six key specs—gross vehicle weight rating, gross combined vehicle weight rating, gross rear axle weight rating, maximum payload, maximum tongue weight, and curb weight. 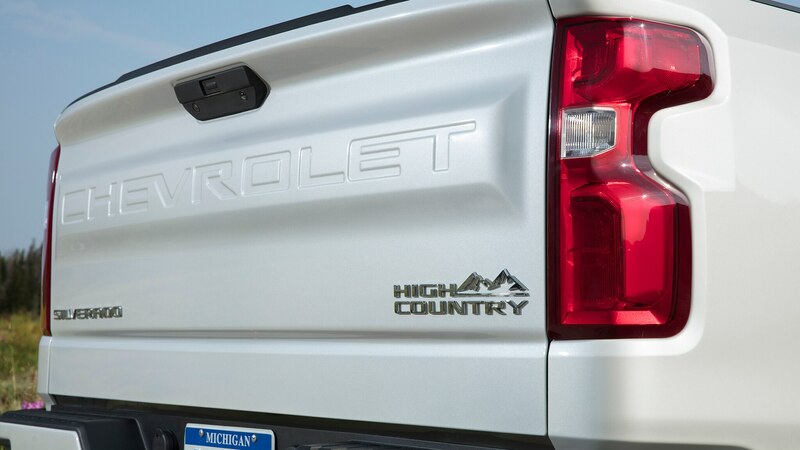 Per its label, our High Country weighed in a considerable 5,441 lbs. 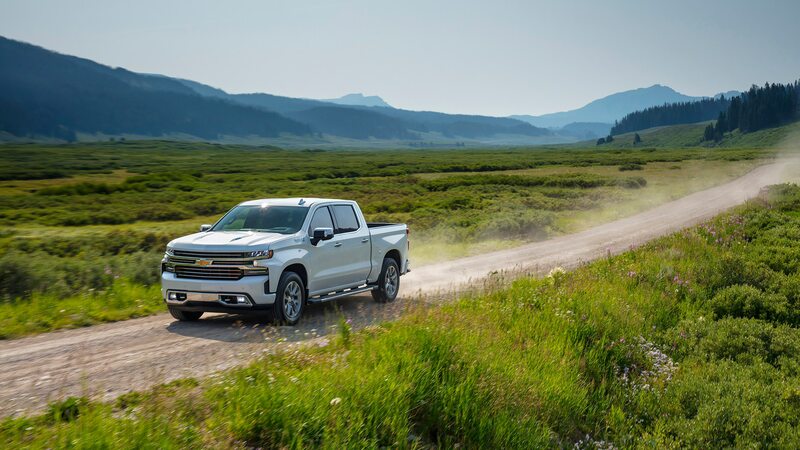 In all, the 2019 Chevrolet Silverado feels more like a well-executed major facelift than a complete redesign, with GM doing just enough to keep the truck competitive in this cutthroat segment while significant uncertainties that include future fuel economy standards and the role of autonomous vehicle technology in the pickup segment are sorted out. 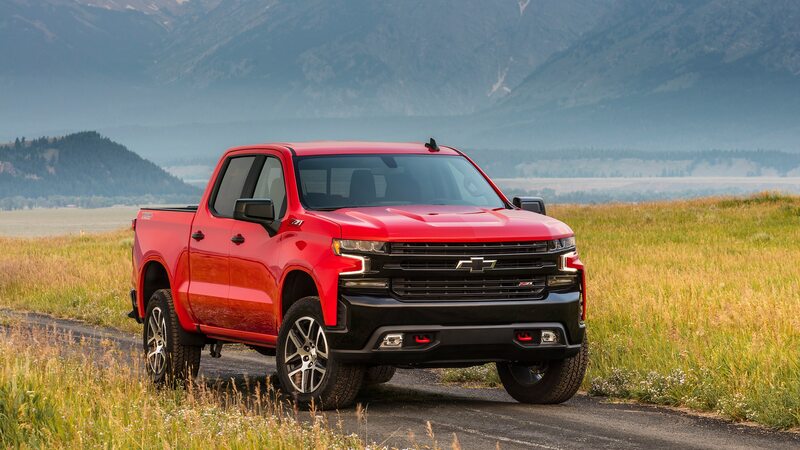 While there’s not much about it that’s truly fanfare worthy, Chevy customers will be happy, especially since they now have the choice of eight trims and six engines, one of which will be a 3.0-liter diesel I-6. 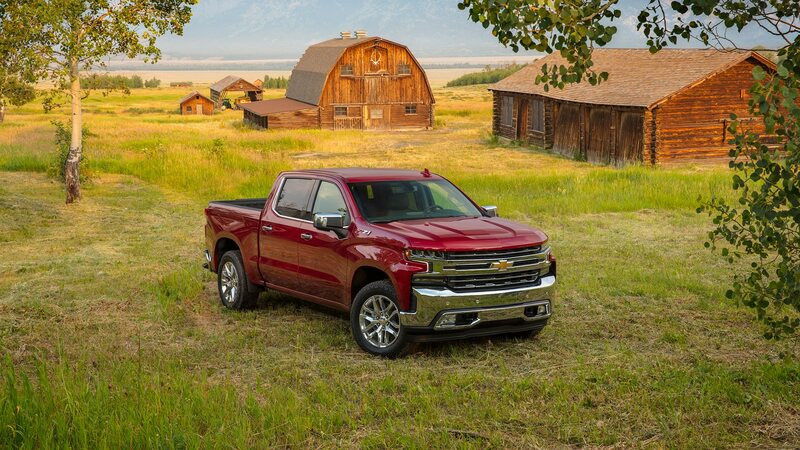 So will the Chevy bosses, who should be able to reduce incentives and thus produce bigger profits.